How often and where the Region team meets will be up to the team to decide. It is useful to plan when and where you will meet 12 months in advance to ensure maximum participation. In metropolitan areas the meetings might be quarterly but where distance is a problem biannual face-to-face meetings supplemented by Skype or teleconferences might be better. Not all members will be able to travel to a central location for meetings and may prefer to join the meeting via electronic means on a normal basis. If at all possible, the location of the meeting should also vary, so that everyone has a similar travel burden. All members of the Region team should attend the meeting, if not for the full meeting then at least for part of the time when matters concerning them are discussed. The meeting is normally chaired by the Region Manager. In large Regions, District Managers may meet separately from other members of the Region team. What Should I have on the Region Meeting Agenda? There will be a great deal of business to cover at each meeting, so it is important the agenda and Region reports are circulated at least a week prior to th e meeting. The agenda should reflect the goals the Region is working towards and the most important items should be taken first. Reports should be taken as read and time made available only to discuss any urgent or important matters arising from them. Some States are introducing standard agendas, but set out here is an example you could use. The Region Manager decides voting rights at the Region meeting; either alone or in consultation with the team. Minutes need to be a true record of matters discussed, decisions made and priority action items. Minutes of the meeting should be distributed as soon as possible after the meeting to ensure all are aware of action points. Minutes can then be formally adopted at the next meeting. In some States the minutes must also be copied to the State Commissioner. provides District reports in advance. 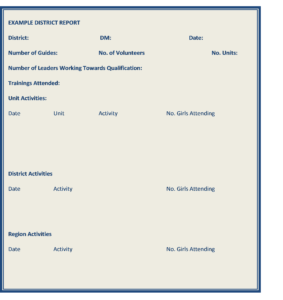 Is there a standard format for District Reports? Most States have standard District reports or assessment forms, whereas in smaller States Districts may complete the Region report template. These reports are designed to collect a succinct summary of activity in the District. They might include information on: membership trends, public relations / marketing activities, program highlights, planned events and leadership team changes.